Malignant melanoma accounts for 1-3% of all malignancies with an increasing incidence being seen worldwide. Subungual malignant melanoma, a form of acral lentigious melanoma is a rare disease with reported incidence between 0.7-3.5% of all melanoma cases in the general population. It accounts for 23% of melanomas in the Japanese population, 25% in the Afro-Caribbean population, and 1-3% in the White population. In one study on subungual melanomas, finger nails were affected in 62% and toe nails in 38%. The thumb and great toe nails were affected in 73%. Other studies, also confirm the most common sites of involvement as the great toes, followed by thumb. Diagnosis is often delayed in those with subungual melanoma with patients going on to have a poorer prognosis than those with cutaneous melanoma and approximately 85% of cases are misdiagnosed initially. Estimated 5-year survival is between 16 and 87%. Early detection of both primary malignant melanoma and metastatic disease is important for initiation of appropriate treatment. Fine-needle aspiration (FNA) represents a rapid, relatively inexpensive, and minimally invasive means to sample and diagnose metastases in patients with melanoma and potentially prevent more invasive procedures such as surgical excisions. This case presents the utility of FNA technique in diagnosis of metastatic melanoma in our setup. 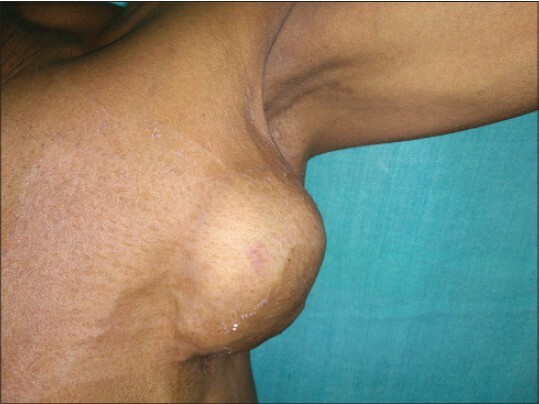 A 45-year-old man presented with large left-sided axillary lump, since 4 months, gradually increasing in size. With a clinical opinion of axillary lymphadenopathy and D/d (differential diagnosis) of 1. tuberculosis 2. lymphoma patient was referred to cytology section for FNAC. On examination, a well-defined 7 × 5 cm, fixed, firm to hard mass in the left axilla was observed. The mass was aspirated with a 23-gauge needle and the specimen spread on a slide, fixed in alcohol and stained with hematoxylin and eosin (H and E) stain [Figure 1]. FNAC of lymph node was performed. FNAC of the mass yielded blackish fluid. Cytological examination of the aspirate revealed hyper cellular smear with round to oval and spindle-shaped epithelial cells loosely arranged with pleomorphic, central, and eccentrically placed nuclei and prominent nucleoli, with abundant cytoplasm containing brownish pigment. A few pigment-laden macrophages were also seen. Few binucleated, multinucleated, and giant cells were seen [Figure 2]. A cytological diagnosis of metastatic deposits of malignant melanoma was given and search for primary was advised. Review of the patient's history was elicited. 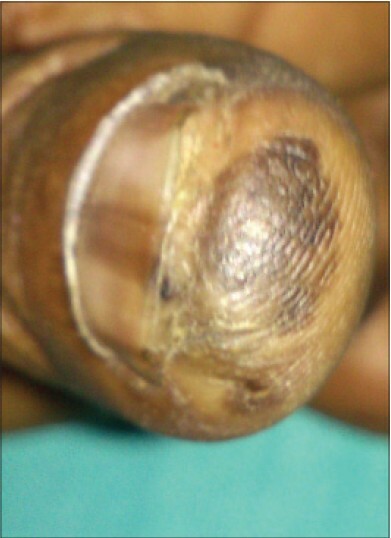 Cutaneous examination revealed a non-tender, 2 × 1 cm, haphazard pigmentation on the left thumb [Figure 3] involving the nail bed, proximal thumb tip and pulp. The lesion showed macular pigmentation. There was a brown longitudinal band on the nail plate. Punch biopsy was advised. Histopathological examination of lesion revealed proliferation of atypical melanocytic cells. Cells showed pleomorphic nuclei and melanin pigment. Mitotic figures averaged five per high-power field. The tumor cells invaded the dermis and reached the subcutaneous (Clarks level 5). 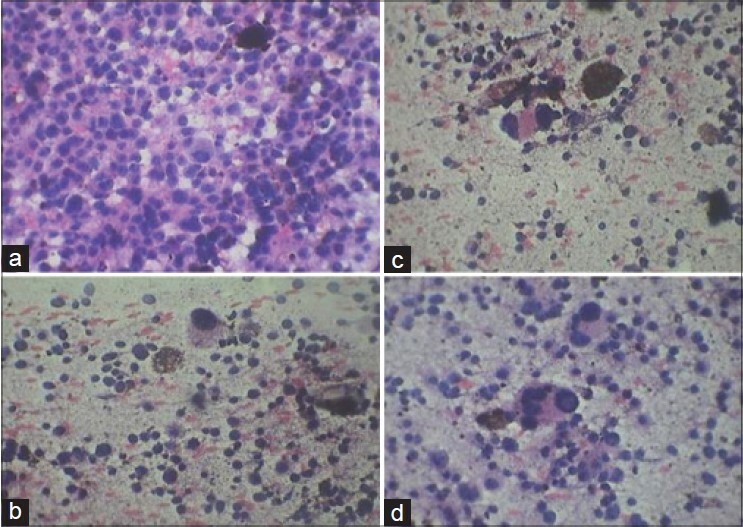 Features were consistent with malignant melanoma [Figure 4]A. Histopathological examination of his axillary lymph node specimen revealed large pleomorphic tumor cells with pleomorphic nuclei and external pigment and increased mitotic activity, just below the capsule. Features were positive for metastatic melanoma [Figure 4]B. Immunohistochemistry (IHC) of biopsies that were sent to higher center showed positive result for HMB-45(IHC) and MELAN-A, thus confirming the diagnosis of malignant melanoma with metastasis of melanoma in lymph node. Patient was referred to surgical oncology clinic. A computed tomography (CT) thorax showed metastatic lesion in cervical and hilar lymph nodes as well as in lung. The patient was referred for chemotherapy. Subungual malignant melanoma, a form of acral lentigious melanoma is a rare disease with reported incidence between 0.7-3.5% of all melanoma cases in the general population. Studies have shown that the most common sites of involvement are the great toes, followed by thumb. Diagnosis is often delayed in those with subungual melanoma with patients going on to have a poorer prognosis than those with cutaneous melanoma, and approximately 85% of cases are misdiagnosed initially. The frequent delay in correct diagnosis of such lesions often results in frankly invasive tumors, sometimes with distant metastasis before they are correctly managed. In our case, patient was unaware of the primary lesion and lymphatic spread had already occurred. FNAC was instrumental in directing the clinicians to the possible diagnosis. In our case, morphologic features of aspirate were in favor of a metastasis of melanoma and malignancy was diagnosed for the first time by the FNAC. Our certainty of cytological diagnosis along with effective clinical history and examination helped us to reach accurate diagnosis. Histopathological examination along with IHC of the excised lesion was used as the reference standard. In the present case, FNAC played a major role in obtaining the accurate diagnosis with the help of clinical history and examination and facilitated institution of prompt treatment. This report highlights the characteristics of subungal melanoma and emphasizes the importance of FNAC in diagnosing it. The primary knowledge of its existence and evaluation of its cytological features are important for a correct preoperative cytological diagnosis and thereby clinical implications for appropriate therapeutic intervention. We conclude that clinicians should make judicious use of the simple and non-invasive/minimally invasive cytological techniques in the management of melanoma patients. 1. Levit EK, Kagen MH, Scher RK, Grossman M, Altman E. The ABC rule for clinical detection of subungual melanoma. J Am Acad Dermatol 2000;42:269-74. 2. Kato T, Suetake T, Sugiyama Y, Tabata N, Tagami H. Epidemiology and prognosis of subungual melanoma in 34 Japanese patients. Br J Dermatol 1996;134:383-7. 3. Heaton KM, el-Naggar A, Ensign LG, Ross MI, Balch CM. Surgical management and prognostic factors in patients with subungual melanoma. Ann Surg 1994;219:197-204. 4. Nair MK, Varghese C, Mahadevan S, Cherian T, Joseph F. Cutaneous malignant melanoma:Clinical epidemiology and survival. J Indian Med Assoc 1998;96:19-20, 28. 5. Vijaykumar DK, Kanan RR, Chaturvedi HK. Plantar acral melanoma:An experience from a regional cancer centre, India. Indian J Cancer 1996;33:122-9. 6. Schaefer-Hesterberg G, Akkooi AJ, Letsch A, Roewert J, Blume-Peytavi U, Keilholz U, et al. Clinically misinterpreted melanoma metastases can correctly be diagnosed by ultrasound-guided fine needle aspiration cytology. Eur J Dermatol 2011;21:238-41. 7. Murali R, Doubrovsky A, Watson GF, McKenzie PR, Lee CS, McLeod DJ, et al. Diagnosis of metastatic melanoma by fine-needle biopsy: Analysis of 2, 204 cases. Am J Clin Pathol 2007;127:385-97. 8. Kline TS, Kannan V. Aspiration biopsy cytology and melanoma. Am J Clin Pathol 1982;77:597-601. 9. Bernacki KD, Betz BL, Weigelin HC, Lao CD, Redman BG, Knoepp SM, et al. Molecular diagnostics of melanoma fine-needle aspirates: A cytology-histology correlation study. Am J Clin Pathol 2012;138:670-7.